Rega Elicit review | What Hi-Fi? Nothing else on the market looks like a Rega amplifier, and not much sounds like one either. The Elicit integrated is an ideal example. It has a swoop in the top panel, and a simple control layout. The large round dial on the front handles both volume and inputs, and alternates between the two depending on the mode button. There are five line level inputs as standard, though one of these can be converted to accept a phono stage if required: a moving magnet board costs £62 and the moving coil £92. It's a shame Rega has chosen not to fit a headphone output. So how does the Elicit sound? It's a decent amplifier, but not outstanding at this price level. 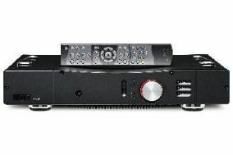 The pleasing thing about this amp is the way it organises detail: the Rega is a musically cohesive performer that conveys the emotion in John Legend's voice throughout his Evolver set with skill, making it easy to get involved in the music. The result is fast, fluid and fun, though not flawless. The shortcomings aren't great enough to stop you from enjoying the music, but they are enough for this integrated to lose a couple of stars. The Rega falls short of delivering the insight of the best at this price level and suffers from a mild dose of dynamic restraint. It doesn't stop things from being entertaining but it is enough to zap some of the drama from The Dark Knight's OST. We'd also like a bigger sense of scale and more precision in the way this amplifier renders subtlety. That reads like a lot of criticism, but this is a fundamentally likeable product. It makes music enjoyable and though there are others at this price level that we prefer, we still think the Elicit is worth a listen.